Why did you choose to study abroad with SIT? I chose SIT based on its reputation as a challenging program leading up to a month-long Independent Study Project. Having previously traveled to Africa, I was looking for a rigorous learning environment – rather than “academic tourism” – to build on my double major in International Studies and French Area Studies, both with a concentration on sub-Saharan Africa. SIT Cameroon’s theme of “Culture, Social Change, and Development” was in line with my majors, and the ISP seemed like a great opportunity to draw upon my studies while also gaining knowledge that’s hard to find squeezed between binders’ boards in a library. What led you to this subject for research? In the fall of 2016, I set out for an SIT study-abroad semester in Cameroon with the intention to find a research topic that would examine the capacity of individuals to lead their own lives and the resilience I associated with Africa, as well as the flaws at the heart of this resourcefulness. I had no particular interest in mobile phones, but during a previous visit to a village in Ivory Coast, I had been surprised to find Androids and iPads where there was no electricity or running water. With this in mind, I landed in the capital, Yaoundé. Soon after my arrival, seeking to put credit on my phone, I was directed to a woman sitting under an umbrella by the roadside. She appeared to be selling cigarettes, beignets, alcoholic drinks – just about everything but phone credit. Tentatively I walked over to her and, expecting to be laughed at, asked for credit. To my surprise, she pulled out three cellphones from her coat, asked for my phone number and how much money I needed. A few manipulations later, I received a text message alerting me that the sum I had purchased had been received. The woman had not moved and barely spoken. All she had done was press a few buttons on one of her three phones and in a matter of seconds, the transaction was completed. I was baffled and this interaction furthered my intrigue to learn more about the role of local agency in the adoption of mobile telephony in West Africa. Mobile phones are often, rightly or wrongly, thought of as a universal good or an improvement of quality of life. Are those attitudes common in the countries you studied? Do they look at the issue differently? Broadly speaking, West Africans in the countries I’ve studied share similar attitudes to people in the U.S. in that they laud mobile phones for their capacity to allow instantaneous communication while there are also fears concerning their societal impact – such as the dissemination of fake news on social media. However, large-scale development induced by mobile phones is so far more wishful thinking than a reality in West Africa and the wider sub-Saharan region. The consumption of electricity in all of sub-Saharan Africa – 48 countries, about 1 billion people – is still lower than that of Spain with fewer than 50 million inhabitants. Mobile telephony is not a quick-fix for deeply entrenched infrastructural underdevelopment. The ICT4D discourse also wrongly rests on a model of development with “backward,” developing nations that do not match the realities of the continent. A region of the world where smartphones cohabit with mud huts is not “behind” or needing to “catch up,” rather it is unique in history and on a different plain. A region of the world where smartphones cohabit with mud huts is not “behind” or needing to “catch up,” rather it is unique in history and on a different plain. What surprised you, in terms of doing the research and/or in terms of the results of your work? There are many very creative uses of mobile phones and marketing offers which reveal insights on local habits, but two forms of appropriation and acculturation stood out to me. The first one was a man in a village in Cameroon walking around with a wireless landline-type phone made in Japan. He had reconfigured the phone to integrate a Cameroonian SIM card and to send text messages like a regular mobile phone. In his “mobile landline” this man keeps over 200 anonymous numbers so his wife can’t look through his contacts. He’s memorized the last three digits of each number to know which number belongs to which contact. This was a great example of how local agency operating within the sphere of the local informal cellular economy and “glocalization” – the intersection of the global and the local – leads to the appropriation of the technology. The second instance was the “MTN Cool” bundle offered in Guinea. MTN Cool allows users to call for a third of the usual price, every night between midnight and 6 a.m. This offer was extremely popular among the youth, who often stayed up all night talking to their friends and downloading films as their parents were asleep. However, the traffic exceeded the revenue and when MTN raised the tariff their subscriber rate fell from around 3,000 users to 160 in one day! MTN Cool exemplifies how mobile operators first identify local trends to tailor their offers and rates, which in turn enhance and at times reshape societal habits. What made your experience with SIT a good one? The professionalism of the SIT staff and the hospitality of the host families were at the heart of my positive experience. While putting students in the best possible conditions, the SIT staff also allows the independence and – at times – the discomfort necessary for personal growth. That was the case during my research as the SIT staff intervened when needed, connected me with local resources and provided sound advice while also providing enough room to carve my own path. They kept a caring eye on me but did not hold my hand. The host families are the fulcrum of the SIT experience. I had the chance to stay in five very generous and welcoming families – most of which I’ve remained in contact with. While local hospitality is the norm, living with host families requires adaptation and efforts that can at times be tiring but are entirely worth it. These newfound perspectives led me to reflect and often reconsider previous habits and beliefs, while strengthening others. My publication is a small token of the quality of the SIT Cameroon program, and beyond academics, I’m very thankful for the relationships I forged during my stay. How did SIT aid you in making this research a reality? How did your research end up becoming a book? The SIT program in Cameroon, led by Christiane Magnido, is exceptionally well-organized and instructive. With their wide network, Ms. Magnido and Program Coordinator Serge Atangana set up thought-provoking discussions with guest speakers, found recognized local advisors for students based on their research topics, and organized travels efficiently throughout the country, in spite of difficult circumstances. Furthermore, SIT offered courses on data collection and reviewed my questionnaires to ensure proper research ethics. 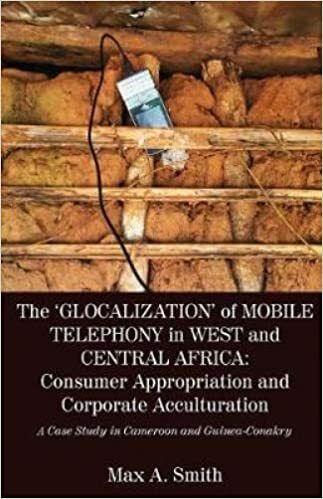 As a combination of these factors, I was able to conduct preliminary studies and to efficiently ground my research within the local context to compile a 65-page ISP on Cameroonian ways of appropriating mobile telephony. My ISP was a stepping stone for additional research. During the summer of 2017, I obtained funding from Kenyon College to further this study during a month-long internship with the international telephone company MTN in Guinea-Conakry. As part of a senior honors thesis, I combined my findings from Cameroon and Guinea. Anthropologist Francis Nyamnjoh, who has conducted extensive research on mobile telephony in sub-Saharan Africa, offered to publish my work. Under his guidance I edited my thesis and it was published by Langaa, a Cameroonian company. I am now in Togo on a nine-month Research Fulbright to study the impact of mobile telephony on the rural-urban “divide.” I am splitting my time between the capital, Lomé, and rural areas to assess the content and the effects of instantaneous communication, which not only bear upon the social structure and collective imaginary but may also ultimately lead to the acceleration or deceleration of the rural exodus. Beyond my current research, I intend to keep working in sub-Saharan Africa and I trust that as I continue to enjoy my work, opportunities will arise.